Standard quality control of each lot Western blot analysis (unlabeled antibody, #AGC-022), and immunohistochemistry (labeled antibody). Immunohistochemical staining of perfusion-fixed frozen rat hippocampus sections using Anti-EAAT2 (GLT-1) (extracellular)-ATTO-633 Antibody (#AGC-022-FR), (1:50). 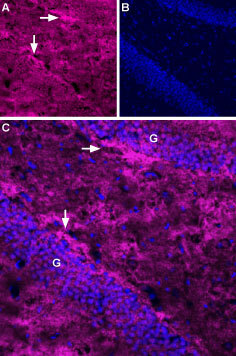 A. EAAT2 (magenta) is detected in clusters (arrows) along the sub-granular layer of the dentate gyrus. B. DAPI counterstain is used to visualize cell nuclei (blue). C. Merge of A and B. G = granule layer. In addition to Glu uptake, the glutamate transporters provide glutamate for the synthesis of g-Aminobutyric acid (GABA), glutathione and protein, suggesting an interactive role between EAATs and cellular metabolism1,2. Anti-EAAT2 (GLT-1) (extracellular) Antibody (#AGC-022) is a highly specific antibody directed against an epitope of the rat Excitatory amino acid transporter 2. The antibody can be used in western blot, live cell imaging, and immunohistochemistry applications. It has been designed to recognize EAAT2 from human, rat, and mouse samples. Anti-EAAT2 (GLT-1) (extracellular)-ATTO-633 Antibody (#AGC-022-FR) is directly labeled with an ATTO-633 fluorescent dye. ATTO dyes are characterized by strong absorption (high extinction coefficient), high fluorescence quantum yield, and high photo-stability. ATTO 633 has a maximum absorption at 629 nm and a maximum fluorescence at 657 nm. The fluorescence is excited most efficiently in the range 610 to 645 nm. This label is analogous to the well-known dyes Alexa 647, Alexa 633 and Cy5. Anti-EAAT2 (GLT-1) (extracellular)-ATTO-633 Antibody has been tested in immunohistochemical staining and is specially suited for experiments requiring simultaneous labeling of different markers. Anti-EAAT2 (GLT-1) (extracellular) Antibody (#AGC-022), (for western blot analysis).